After the government signed a coalition deal with Avigdor Lieberman last week, all that remained was to vote him in as defense minister. But Bayit Yehudi leader Naftali Bennett threw a spanner in the works that threatened to derail the government, threatening to boycott the vote until military attachés were appointed to keep the security cabinet up to date in Israel’s security affairs. His obstinacy and Netanyahu’s obduracy threatened to topple the eighteen month government until Yaakov Litzman of UTJ saved the day by suggesting a compromise acceptable to both sides. The cabinet and Knesset then voted in favor of Lieberman’s appointment and he was sworn in as Israel’s new Defense Minister. At the same time, Environmental Minister Avi Gabai of Kulanu resigned while harshly criticizing Netanyahu for leading Israel on a path to destruction. Just when Lieberman needed to be voted in as Defense Minister, Bennett suddenly demanded to have military secretaries appointed to each of the ten Security Cabinet ministers to keep them up to date in military affairs and threatened to have his eight members vote against Avigdor Lieberman’s appointment unless his demand was met. Prime ministers and defense ministers have long made their own decisions with heads of security agencies while leaving security cabinet members in the cold, but Bennett had enough of it. Bennett sprang his demand after a report revealed that a former state comptroller and investigative reports supported his viewpoint. The Winograd Report published after the 2006 Second Lebanon War pointed out that the security cabinet was bypassed by unofficial forums in Prime Minister Olmert’s office, and a state comptroller’s report about the 2014 Gaza War noted that the security cabinet was deprived of important information before and during the conflict, particularly regarding the Gaza tunnels which most of the security cabinet knew nothing about. Bennett now revealed that he been trying to prod Netanyahu to fix the situation for two and a half years and got nowhere. “Human life is more important than government portfolios,” Bennett explained on Facebook. “I left the high-tech and came to politics after I saw, as a commander in the Second Lebanon War, what happens when the country’s leaders send soldiers into battle without knowing what they’re doing. I didn’t need work, a position, money or a job. I swore to myself that I would not let what I saw happen again. “Our demand is simple and dramatic: that the commander of the army chief and the army, that is, the security cabinet, the body which makes fateful decisions of life and death, stop being blind. And at present it is willfully blind. We demand that the cabinet members get training, that they get material before hearings. That they go down to the places involved to see things for themselves, that they get a complete, uncensored picture of all fronts. That we get a [military] secretary coming to us once or twice a week to update us on everything we need. “Unfortunately, this is not happening today,” Bennett added. “Members of the cabinet are consistently deprived of essential information…. Bennett rejected Netanyahu’s offer to establish a panel headed by former National Security Council head Yaakov Amidror to examine the situation, calling it an evasion of the issue. In further intensification of the conflict, Likud warned that it would fire Bayit Yehudi’s three ministers, Education Minister Bennett, Justice Minister Shaked and Agriculture Minister Uri Ariel, if they made obstacles to Lieberman’s appointment. “We are on the brink of a political crisis, which may get worse on Monday if Bennett votes against the government and as a result Bayit Yehudi is no longer in the coalition,” Tzachi Hanegbi of Likud told Channel 2. Had Bayit Yehudi left, Netanyahu would have lost his government majority unless Zionist Union leader Isaac Herzog would leap into the breach. But Herzog was not interested in throwing Netanyahu a lifeline. Instead, he mocked a Haaretz report that he was nibbling at Netanyahu’s line. To make things worse, an Israeli Radio opinion poll indicated that if new elections took place, a center-right party headed by former Defense Minister Moshe Ya’alon, former Interior Minister Gideon Sa’ar and current Finance Minister Moshe Kachlon would garner twenty-five seats and enable them to set up a new government without the Likud party. Ultimately, Yaakov Litzman of UTJ saved the day by pushing a compromise whereby the head of the National Security Council (NSC) or his deputy would keep ministers informed of military affairs until a committee set up by Netanyahu presents its findings in three weeks’ time. Bennett and Netanyahu climbed down their respective trees and the cabinet unanimously voted in Lieberman as defense minister. His party member Sofa Landver was accepted as immigrant absorption minister and Tzachi Hanegbi of Likud was approved as a minister without portfolio in the Prime Minister’s Office. Environmental Minister Avi Gabai of Kulanu resigned in protest over Lieberman’s appointment to the position of defense minister. Lambasting Netanyahu’s style of government, Gabai said that replacing Ya’alon with Lieberman was something he could not swallow and that Netanyahu’s handling of the natural gas agreement was a sign that he was trying to weaken public servants and prevent them from expressing their views. Gabai added that the government was moving towards extremism and wrecking ties with the U.S.
Joint (Arab) List Knesset Members Ahmad Tibi and Taleb Abu Arar warned a delegation of five U.S. congressmen visiting Israel that Lieberman’s admission to the coalition and his appointment as defense minister was a major obstacle to any peace process and asked the U.S. not to veto a Security Council resolution the PA may push for in the future ordering Israel to halt expansion in the West Bank and east Yerushalayim. 2,000 left wingers demonstrated against Lieberman’s appointment in central Tel Aviv, marching towards Likud headquarters while chanting that Lieberman is a fascist and the minister of war. 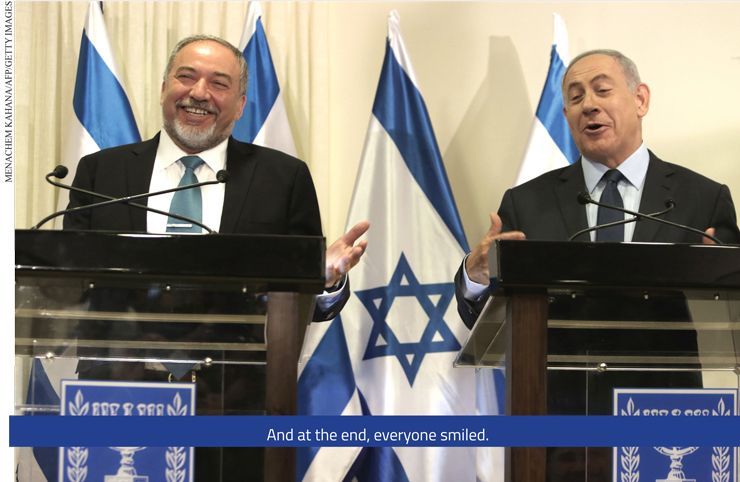 All this was despite Lieberman and Netanyahu’s ringing declarations of commitment to peace when Lieberman formally joined the coalition last week. In a surprising development, Netanyahu stated in a press conference after Lieberman’s swearing in ceremony that he was not only willing to pursue a peace deal with the Palestinians, but also agreeable to doing so under a framework suggested by a group of Arab states led by Saudi Arabia. This demands a return to pre-1967 lines and a solution to the Palestinian refugee problem. But revisions to the plan would be necessary. “We are willing to negotiate with the Arab states’ revisions to that initiative so that it reflects the dramatic changes in the region since 2002, but maintains the agreed goal of two states for two peoples,” Netanyahu said. Lieberman also expressed agreement to the Saudi proposal which Israel considered for the first time last year. First broached in 2002, the Arab plan spoke for the first time of possible diplomatic relations between Israel and fifty-seven Arab and Muslim states. Crown prince of the Likud party Benny Begin blasted Lieberman and his Likud supporters, saying that it was a mistake to appoint him defense minister instead of Moshe Ya’alon and a disaster that Netanyahu and Lieberman were boasting about setting up a Palestinian state. Begin pointed out that according to ideas Lieberman spoke of in the past, the western border of a proposed Palestinian state which may quickly turn into a Hamastan would run along Highway 6, which borders Israel’s central coastal plain. Ahead of signing a final agreement, Lieberman agreed to scale back his coalition demands after the Finance Minister insisted that special pension payments should be provided not only to 80,000 poor elderly immigrants from the former Soviet Union as Lieberman wanted, but to all eligible elderly people at the cost of 1.4 billion shekels instead of Lieberman’s request of three billion. Lieberman also softened his demands regarding facilitating death penalties for terrorists. Yesh Atid chairman criticized Lieberman for succumbing to chareidi demands. Bennett blasted his erstwhile partner Lapid with an unprecedented attack at the Knesset the next day, accusing him of attacking the chareidim to get more votes. Bennett explained afterwards that although he also wants chareidim to adopt the Liba curriculum, Lapid uses bulldozer methods to achieve it, which is not his approach. 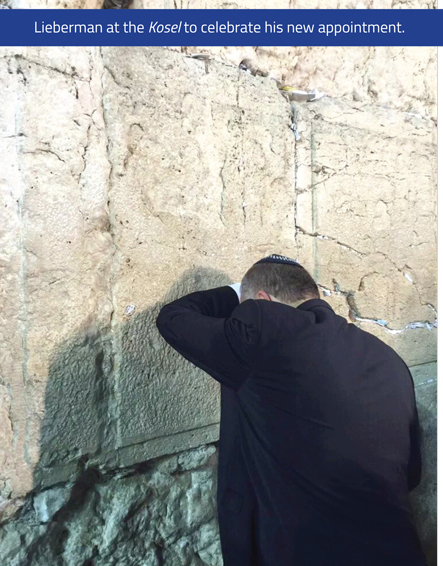 “After all your hafroshas challah and going to the Kosel you have gone back to being Yesh Atid, you have gone back to squabbling with chareidim,” Bennett concluded. The chareidim were left to decide on their best friend: Lapid, who has been beaming at the chareidi world lately except this week’s slipup, or Bennett, who sprang to their defense.